Barça B are coming home pointless from the Ramon de Carranza after falling 3-1 to a Cadiz side that took its chances better, especially in the second half. It was anything but a poor performance from the Catalans, but they were up against a side that’s won seven games in a row, and on Friday night they showed why. Indeed, with the Andalusians flying high at the top of the table, the chances are they’ll be playing the Barça first team in La Liga after the summer. 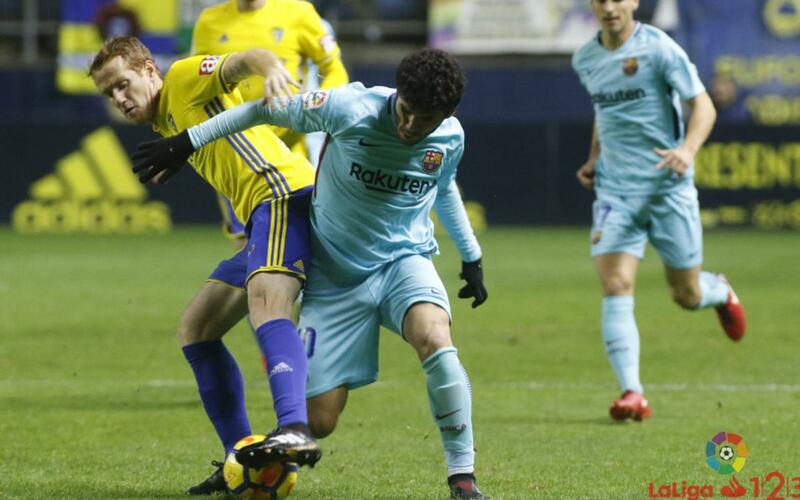 Gerard López’s side played the typical FCB possession game in the first half, but Cadiz had a well-rehearsed counter attack plan to deploy in response. That said, the first half was a largely uneventful affair. The game had barely restarted when the home side would have doubled their lead had Ortolá not produced a marvellous penalty save. But Cadiz were now on full throttle, and they did go 2-0 up when Carrillo converted a fine assist from former Barça man Romera. And the same man put the game beyond Barça’s reach when this time he was able to convert from the penalty spot. Barça went in search of a miracle, and substitute Marc Cardona led the quest, being rewarded with a consolation goal on his return from injury. Monchu of the U19 team also got a run out with the senior reserves fror the first time ever, but as far as getting anything out of this game was concerned, it was a lost cause. It’s now time to turn the page and focus instead on next Tuesday’s game at the Miniestadi against fellow strugglers Albacete.